The Historic Highway 11 Treasure Trails begins TODAY! This event is an 80-mile flea market and yard sale that runs from Linden to Sulphur Springs. Have a few items you’d like to sell but don’t live on Highway 11? Set up for FREE in our flea market area in the old Capital One parking lot. This is a fantastic location with LOTS of traffic driving by. Contact the Chamber office at 903-856-3442 for more details. 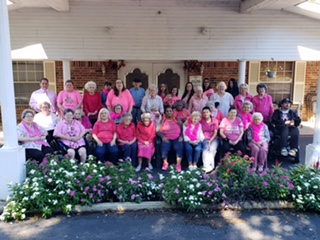 Staff and residents of Southern Wind Manor in Pittsburg showed their support of breast cancer awareness earlier today. What a great looking group of folks wearing pink. They will continue to wear pink each year until a cure for breast cancer can be found! Exciting News! 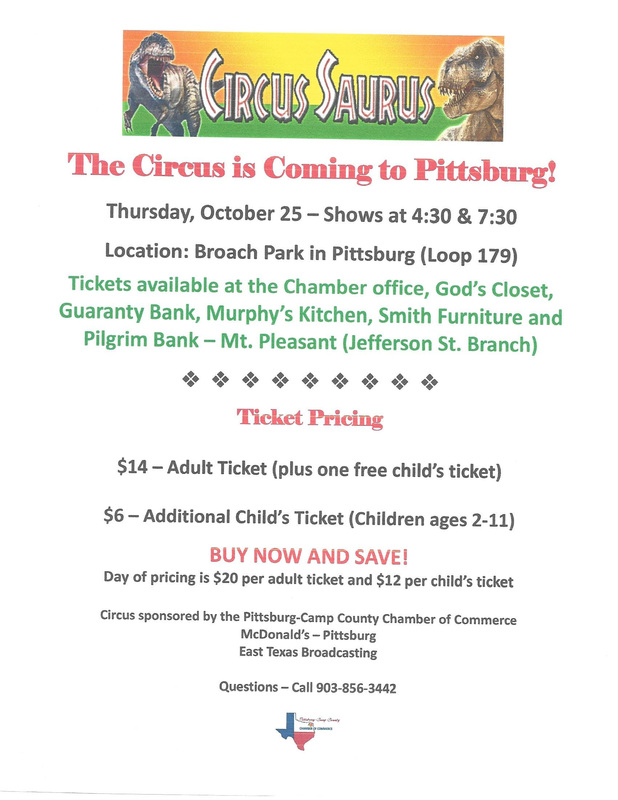 The Circus is Coming to Pittsburg on Thursday, October 25! Circus Sponsorship Opportunities are still available. This is a fabulous way to get your business name out to hundreds of families here in Camp County, as well as the surrounding area. 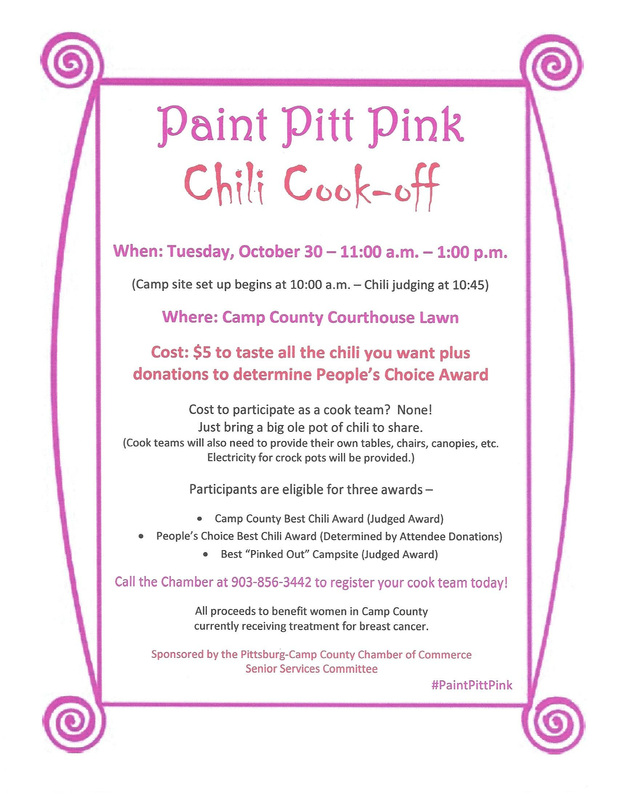 For more information, contact the Chamber office at 903-856-3442. Do you have an item you would like included in an upcoming e-newsletter or on our Facebook page? 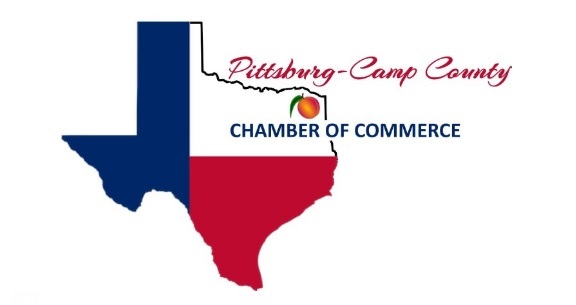 Please let us know by calling 903-856-3442 or email info@pittsburgcampcountychamber.com. Ø Wireless home phone for $20.00 a month (great for churches and small businesses). Rustville’s Soap Shop offers the most luxurious, natural, and handmade bath and body treat this side of the Mississippi! We create old-fashioned, cold process soap, bath bombs, hand and body lotions, body butter, sugar scrubs, and candles. We have our ever-so-popular Charcoal FaceBars, as well as our own line of skincare to help you look and feel your best- naturally. We also carry essential oils and all the accessories: home and car diffusers, diffuser necklaces and bracelets, and custom essential oil blends, as well as roller bottles. We make those popular little CarTarts, too! (Air fresheners). If you are wanting gift sets, we offer custom, made-to-order gift baskets that include a seagrass or wicker base, plus the products you choose, wrapped neatly with a large, fabric or burlap bow. We don’t skimp on our gift baskets… we like to think we offer the most luxurious gift baskets you can find! If you have specific needs or requests, don’t hesitate to run them by me! I’m sure we can figure it out and create the very best, high quality, natural and most unique gift tailored to your needs. Our little shop was voted Best of the Best in 2018, by our community, in the Gift Shop category. Don’t forget to come to shop Rustville! Let me know if you have any questions. I am happy to help. Northeast Texas Community College is working on a new strategic plan to help pave the way for the next five years. As a community college, we believe it is very important to receive feedback from local stakeholders. With that in mind, we hope you will take just a few minutes to complete the survey below. Your responses will go a long way toward helping NTCC do a better job of serving our community today and in the future.